I can't remember whether or not I have written about banana bread before. It was something my mother made frequently, I suppose owing to the simple fact that it calls for over-ripe bananas, and for some reason that happened fairly often in our house, even with six people living in it. I always loved the smell of it baking, but it was not my favorite sweet thing to eat. I hated most banana-flavored foods, but because it was so often the only sweet option in the house, I learned to tolerate it. And I would even bake it as an adult, whenever I found that I had bought more bananas than I could eat before they turned. And while I still loved the way it smelled, the taste, not so much. I would take it to work or bring it to friends after one piece confirmed to me that my taste had not changed. With this loaf, I am surprised to say, it has. 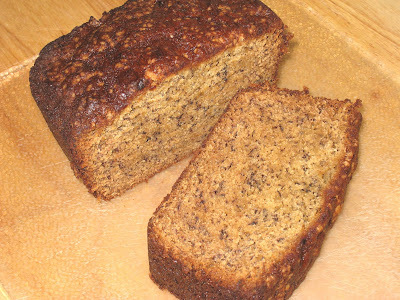 This banana bread is moist, rich, and sweet, with just the right amount of banana flavor. I am not sure why, but I suspect part of it might be the ingredients, and part of it might be how over-ripe my bananas were. In addition, as I have grown more aware of the huge disconnect in this country between the food we eat, how it is produced, and from whence it comes, I have made the choice to use ingredients as close to their original states as possible. So, the bananas are fair trade, the flour is white whole wheat, the butter and eggs are organic, and the sugar is fair trade organic evaporated cane. The baking soda is the only conventional name-brand product in the mix. And now that I have decided to do some research on that, I have discovered allegations that they test on animals, so I will have to look further into that and decide what I want to do about it. In the meantime, this recipe is ultra easy to prepare. The trickiest part is making sure you have the ripe bananas, and that they they are over-ripe enough. This was so good, however, that I think there will be many occasions in the future when I will take a look at my bananas, see a brown spot or two, and decide that they are beyond edible consumption and I might as well wait another three or four days and make banana bread with them. The recipe as originally written is just a list of ingredients and two short sentences. In those days, it was assumed that one would know what to do with the ingredients without needing step by step instructions. Preheat oven to 350 deg. F. Peel the bananas. Put them in a small bowl and mash them well with a fork unti they have become liquid. In a medium bowl, combine the flour, sugar, baking soda and salt, then whisk well to blend the ingredients together. In a larger mixing bowl, beat the egg. Whisk in the melted butter and then the mashed banana. Add the dry ingredients and stir just until combined. Pour the mixture into a greased loaf pan (approximately 8 x 4 x 2 1/2 inches). Bake at 350 deg. F. for 50 minutes to an hour, until a toothpick inserted into the center of the loaf comes out clean.